For stock holders, the fourth quarter was painful; erasing the 10% rise we had seen up to that point and finishing 2018 at -6.2% for the S&P Index. Often when the stock market tumbles like it did, part of what feeds it is the fear of it continuing and thereby pushing it further than fundamentals suggest. Despite the recent difficulty, we don’t believe a recession is imminent with the healthy economic back drop we currently have. In 2011 and 2015 we experienced market downturns lasting 3-6 months and neither derailed economic expansion. We also haven’t seen the type of excess we would expect to see in a market bubble. The tensions of the trade stand-off are playing out in real time and putting pressure on both the Chinese and US Presidents to resolve it. For now, as we go to print, both Presidents have agreed to a fragile 90-day truce, ending March 1st, the 1-year anniversary from the first tariff announcement. The truce delays any increases on current tariffs. To resolve the trade-war China will need to impose stiffer penalties on intellectual property thieves, limit their own industrial subsidies and facilitate additional purchases of American goods. If these remain unmet, we will continue down this troublesome path. If this continues the risks are two-fold: Tariffs are bad for companies as it puts pressure on their supply chains, revenues and profits. They also act like a tax on consumers and manufactures by increasing costs and creating a drag on the economic growth. Since the start of the “trade-war” both economies and stock markets have suffered and face a more challenging outlook. The Shanghai stock market declined -24% in 2018 and the Chinese have started their own domestic easing in anticipation of a future slowdown. It is certainly in the best interest of both countries to find a resolution to these trade issues. In December, the Federal Reserve increased short-term interest rates for the 4th time in 2018, this was consistent with what was expected but was also followed by some immediate selling in the stock market. As we’ve mentioned before, the goal of the Fed is for modest growth without spurring inflation. Raising short-term interest rates increases the cost of borrowing and slows an overheating economy. In the process of trying to succeed in slowing economic expansion, they often exceed – pushing the stock market into a sharp decline and bringing on an economic recession. We have seen similar yield curves to this in the past, in 1998 and 2005, and both were 2-years premature to a stock market decline and recession. As we start the year, the yield curve continues to flatten. Still not quite the warning signal we have been looking for but as it persists we have become cautious about adding to stock positions. The Federal Reserve has said they will increase interest rates two more times in 2019. We believe they are giving consideration to low unemployment rates, currently 3.9%. Low unemployment puts pressure on employers to increase wages and the price of their goods and services. If we consider “full employment to be around 4-4.5%, the economy is beyond full employment. The Fed will be weighing the inflationary influence of exceeding full employment with the potential for economic slowing of stock market activity. With that said, we also believe the recent market decline may influence the Fed to reconsider and possibly hold off on additional rate increases. 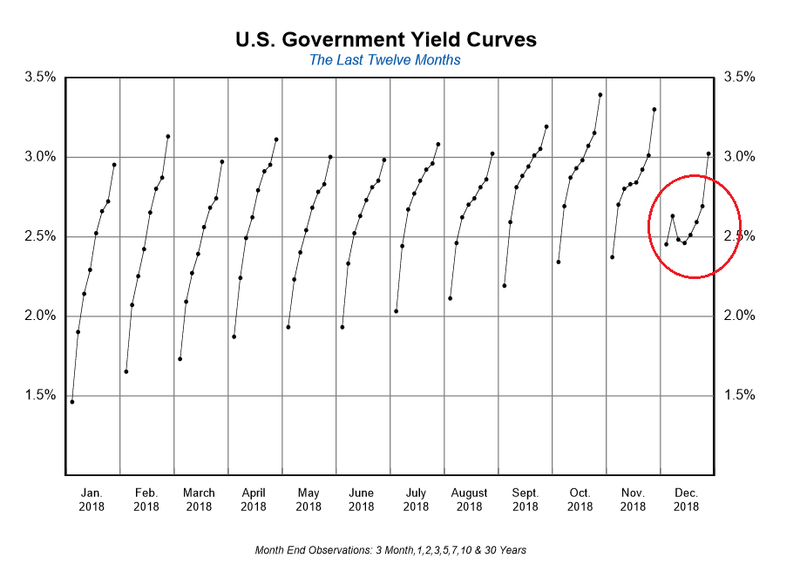 Due to the trade war and partially inverted yield curve (see graphic) we plan to be patient as some uncertainty gets worked out in the market. We are also spending time going through each account and speaking with clients to discuss their cash flow needs. It is important that investors look at their investment allocations to make sure they have enough money in stable investments (cash and short term bonds) to cover anticipated cash needs for several years (3+). This will provide the cushion and comfort needed to look longer term at what could be allocated to stocks with the expectation of higher returns over the longer timeframe. As we look to the future, and select companies to invest in, we are giving strong consideration to those developing technologies that will continue to bring growth and wealth around the world.